Best setting for the camera? Friends, my camera is strange ... could anyone help me with the best settings for a closer view and a little lower than the default? Thanks. The "best" setting are those you like the most. For myself, I find the default angle (up-and-down) to be just fine, though I also prefer to be a little farther (distance) back so I can always see my feet (to be sure I'm wearing shoes, etc.). The best thing to do is to experiment with the sliders until you have it where you like it. Beyond that, it's difficult to help better as your initial post is a bit too ambiguous without any detail about your difficulty. Hello ... sorry, I missed information. I wanted this, https://gyazo.com/a6840d423e64bfc5810842df2b493c56 but i am forced to use this hud https://marketplace.secondlife.com/p/Rear-View-Camera-Control-HUD/14023208 . I wanted to know if I can have this vision, but without hud. Could you please send me your setup numbers? Thanks. Go into the Debug settings (plenty of information on how to get there exists) and set cameraoffsetrearview so that X = -2, Y = 0 and Z = -0.2. Then find focusoffsetrearview and set X = 0.9, Y = 0 and Z = 0.2. Do note that the Camera Offset values are NEGATIVE values. I would put a check mark in the allow the cam to move thru prims. IMO that should be on by default. You have Firestorm so open the Photo Tools to control most of the visible appearance of the viewer and the environment when making temporary changes. If you are taking snapshots you'll use different settings than for machinima. Also, one set for exploring, one for shopping, and another for roleplaying. When you change the Debug Settings the ESC key will snap you back to your newly set values. HOWEVER, SHIFT-ESC will clear your Debug setting changes. There are keyboard shortcuts for changing the Debug Settings. You likely already use left-click Ctrl and Alt to move your camera and possibly mouse steer. 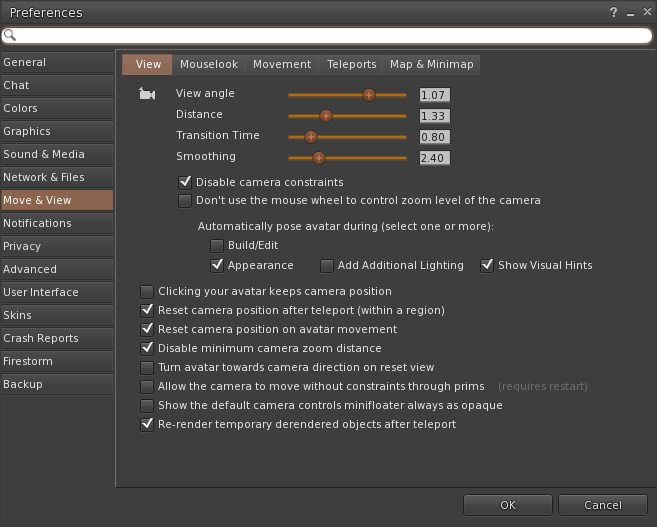 But you can also use Ctrl-mouse-wheel to change the default camera height. Shift-mouse-wheel raises camera position and focus point default values. Thank you, I'll take a look later!